Also known as the Northern Dwarf Tree Frog. It is a leaf and plant stem dwelling species that is often found in hot and dry situations. The call is an interesting high-pitched " wree-e-eck pippip"
A cute, green little fella, distinguished by it's size, and orange on the thigh. It can be distinguished by it's near identical relative, the Green Reed Frog, Litoria fallax, by a barely discernable pale stripe along the side where the green upperparts and the cream underparts meet. 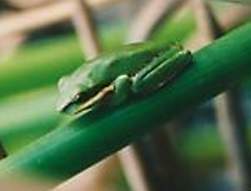 Like it's southern relative, this frog is usually found perched nimbly on green reeds in water.